whats Edomination?! Edomination for us, player is strategic and political game, but for creators of this game, Edomination first of all is business. Every businessmen cares about it business and tries to develop it. Every CLEVER businessmen has long period plan how to develop his business, how to make his product interesting and sell it to other persons. Every clever businessman knows that business is perfect when you are beginning to get profit after some years (from 3-4 to 5-6) , but in first years you re just trying to pay debts for your investment. Are our Admins clever businessmen? definitely NO. Edomination is new game,despite it was created more then 500 days ago. its new game because such games always need years for development. but during those 500 days, almost twice a month we are getting new updates and changes. What does it mean?! It means that Administration of this game NEVER had any long period plan and they just have no any idea how to develop this game. Most of us joined that game after we quit play E*r*e*p*u*b**l*i*k and E*r*e*v*o*ll**u*ti*o*n. Edominations was new game and most of us had hope that it would be good/better/best game, and most of us made good investment in this game. For example Personally my investment there was about 300-400 euros. Of course after few days, few weeks, few month our investments become lower, as we developed our Accounts and countries. And I think that was shock for Administration. 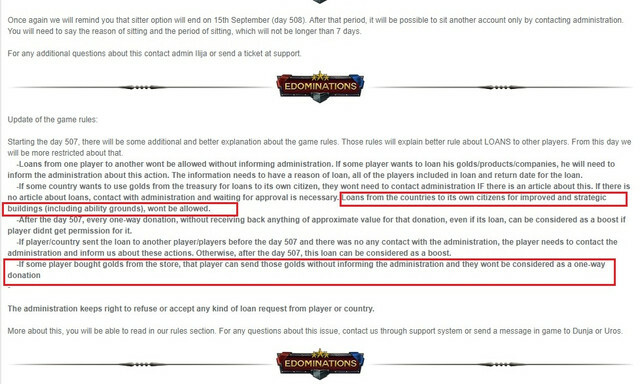 instead of make something interesting or new player from money they got from us, they just begin to create new and new barriers for persons who were playing this game and they tried to force us to make more investment in this game. Do you remember BABY PACKS?! As I remember Admins made this packs because they wanted to make baby booms from Money they got. But, did they made any Baby boom?! To be honest I have no any info about it, probably no. They just put those money in another pocket. What happened in last days, weeks, month?! 15 July of 2018 we got new event. The name of event was ,,Country risk event and countries were able to get from 100 to 2000 gold during this event. Most of countries made deals during that event and they get many golds. After 20 days of Country risk event. When event was still alive. 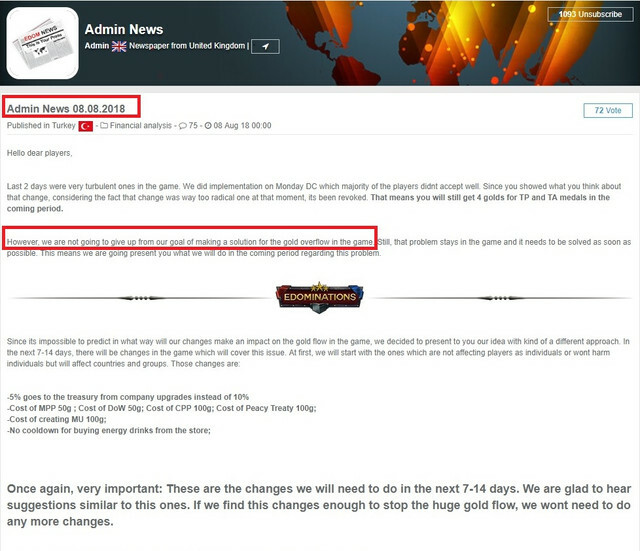 First time we got news from Admins that there is GOLD OVER FLOW in this game, and if we will not change something game will die. I asked this question many times to Administration, but believe me - I NEVER got answer: If there was gold overflow in game, why they begun country risk event and gave to people more gold?! ok, lets imagine that we have gold over flow in the game and we need to take excess gold from game. With this changes Countries are not allowed to give loans to citizens for improved and strategic buildings. 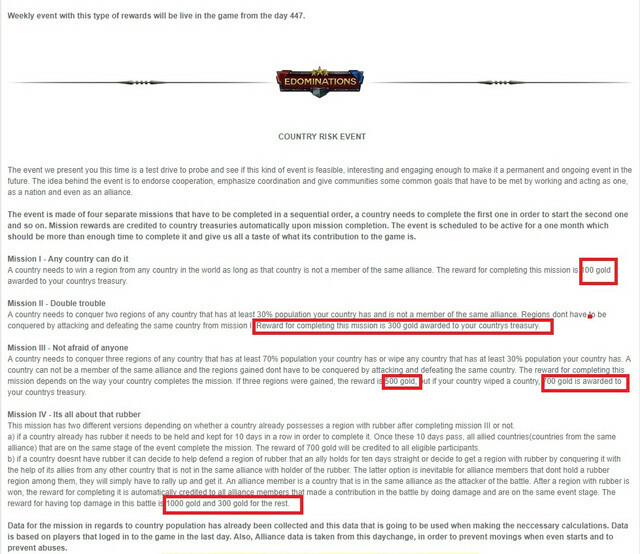 - This is another strike against PLAYERs, not against countries or ORGs but against players?! Why? 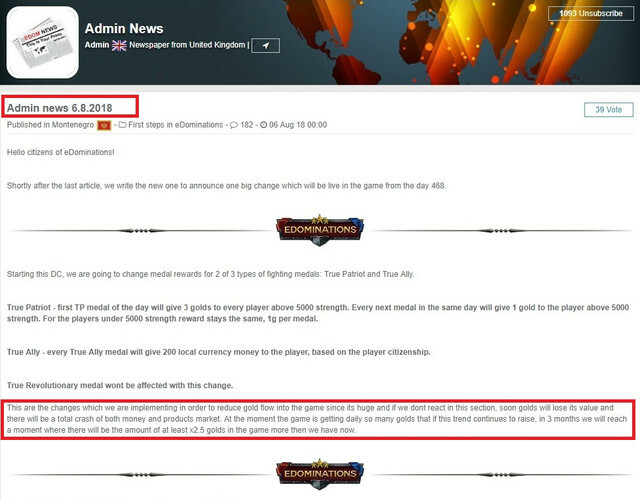 Reason is simply: Our greedy admins needs more euros, and they are shutting down not only illegal, but legal ways to help players with legal gold, and they are pushing them to go in store and buy gold, or they are pushing you to buy in store, to buy gold and then send to new players. Ill tell you my opinion clear, is there any gold over flow in this game?! No guys, there is no any gold overflow. Just there is euro lose in admins pockets and they are doing everything to push us, to buy more gold and they are closing all our ways to earn gold. Someone will say that they care about game, about us and they are doing it all because of game. When you last time had conversation with them?! Did not you notice that they are just publishing articles and do not answer our questions?! look at that picture, mroe then 12 hours game has problem with those double RWs, even now when I am writing this article, after 15 hours of RW begining you can see same picture on battlefield. did they fixed it?! no. Why? Question is simply. they do not care, they even are not coming to see whats going on in game. From Today, this game is dead for me. I am going to stop any political and military activity and if my congress will give votes I will resign from Geo CP position. i will continue my Boycott while something will not change, or server will not shut down. I have loan from Jango 700 gold. Georgian - 30 ოქრო. + 52 ოქრო. ჯამში 82 ოქრო. There are official ways to contact administration, its not my fault you dont use it... Other things in this article are not even worth speaking. What if I put on mm 1g 1cc? That mistake cost me some golds.. But what if I use it for help babys?